Sai Baba, one of the foremost sadgurus of India, lived in Shirdi for 60 years and elevated it to the status of a great Spiritual Centre. He never preached, toured or discoursed. He shunned unnecessary publicity. Yet by the sheer brilliance of his spiritual fire he drew innumerable devotees to him from all over the country, irrespective of their caste or creed. He took Samadhi in 1918 (i.e., cast off his physical body). Yet his power to mould and develop his devotees is such that, even more than 50 years after his Samadhi, Sai Baba is still a dynamic spiritual force that countless devotees invoke for their spiritual and material welfare. Sai Baba was the embodiment of dispassion, purity and simplicity and was an enigma to all. None knew his caste, creed or parentage and neither did he think it was important to reveal it. He taught the unity of all religions and the universality of spirit in all existence. His method of teaching was through direct experience. We urge our readers who are new to the Sai Philosophy to read Sai Satcharitra - the wonderful life and teachings of the supreme master of our age. Popular among both Hindus and Muslims, Sri Sai Baba became a great building force between the two disparate communities. He regularly recited Hindu and Muslim prayers. His Hindu followers considered him to be an avatar or reincarnation of Shiva and Dattatreya. 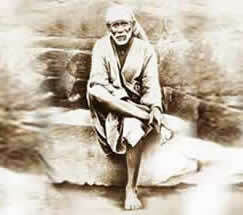 Sai Baba did not leave any written works. All his teachings were oral and catchy. His sayings were short, crisp and in layman language with which the common mass could easily associate. Sai Baba encouraged charity and said, "Unless there is some relationship or connection, nobody goes anywhere. If any men or creatures come to you, do not discourteously drive them away, but receive them well and treat them with due respect." Sri Sai Baba of Shirdi was unique in the sense that he lived his message through the essence of his being. He lived among the common people adorning a torn kafni (long robe), sleeping over a mat while using brick as his headrest and got his food by begging. Such was his smile that radiated a mystical charisma and deep seated inward look that hypnotized the people who visited him. Sai Baba said that he was a slave in the service of those who loved him. He was ever living to help those who turn to him and that he has to take care of his children day and night. Sai Baba's mission was to restore belief in god and according to him, "I give people what they want in the hope that they will begin to want what I want to give them (knowledge of the Ultimate)." He then taught values of total surrender to the Almighty Master (ALLAH MALIK EK- The only ONE) and experiences his grace. Today, Sri Sai Baba has millions of devotees in India and abroad.